There’s just no getting around the Kung Fu Panda. (Of course not! He takes up too much room!). First off Ape Entertainment’s’ Kizoic imprint is releasing the popular Kung Fu Panda comic-book miniseries from last year as a collected trade paperback called Kung Fu Panda: Kung Fu Fighting. And then this July, Po and the Furious Five (and Master Shifu, of course!) 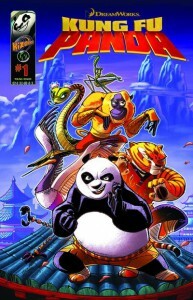 return in a brand-new full-color monthly series, Kung Fu Panda: Tales of the Dragon Warrior (written by Quinn Johnson and illustrated by Massimo Asaro). Find out more about all of these at Things From Another World.